On 9 March 2017，SESEC was invited by the Exciting Project (EU-China Collaboration on 5G and IoT Research Project) to participate in the Conference of EU-China Collaboration on 5G and IoT Research. the conference presented and showcased some of the latest development of 5G and IoT in both EU and China, discussed several EU-China S&T cooperation priorities, such as ICT, standardization, cooperation on large-scale pilots, as well as further explored potential ways towards better cooperation in these fields between both sides. As the representative of EU standardization organizations，Dr. Betty Xu, the director of SESEC, made a keynote speech named “EU 5G and IoT Standardization”. 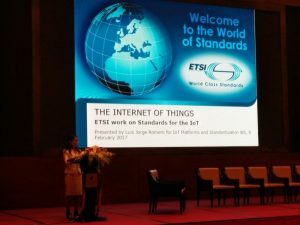 The speech introduced the latest development made by EU standardization organizations: ETSI, CEN, CENELEC, and provided a firm support for the following discussion on EU-China standardization cooperation. The conference provided participants with the first-hand information of 5G and IoT development both in EU and China, as well as the platform of extensive communication and exchange between both sides, so as to lay a foundation for deep and expanded cooperation in the future.